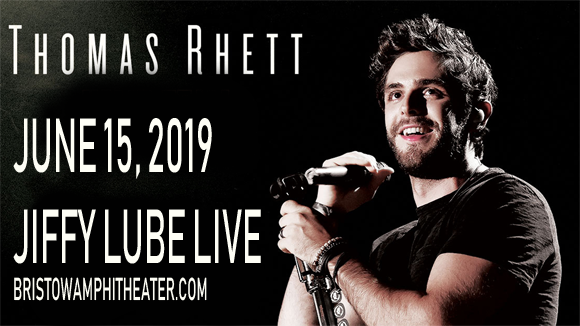 Thomas Rhett is back on the road this year with his Very Hot Summer Tour, stopping by at Jiffy Lube Live on Saturday 15th June 2019 for a night of non-stop, world-class country music! Not only will Rhett be performing all his fans' favorite tunes in an exhilarating headline set, but he'll also be joined by a stellar support line-up of Dustin Lynch, Russell Dickerson and his father, Rhett Akins, for what is bound to be a sensational show! Beginning his music career as a writer for other artists, Grammy-nominated American country music singer and songwriter Thomas Rhett had his big break co-writing the song "I Ain't Ready to Quit" from Jason Aldean's 2010 album My Kinda Party, and went on to write with artists such as Lee Brice, Florida Georgia Line, LoCash and Michael Ray, among others. He began his career as an artist in his own right the following year, when he signed to Big Machine Records' Valory Music Group division, releasing his debut single, "Something to Do with My Hands", in 2012. The single charted in the Top 30 of the Billboard Hot Country Songs Chart, as did his follow-up singles "Beer with Jesus" and "It Goes Like This" – the latter of which peaked at Number 2 and topped the Country Airplay chart. Rhett has released three studio albums to date, including 2017's Life Changes – his most recent release.